This song was written as a love letter to vinyl – you know, good old fashioned records that you have to play on a turntable? I love them for many reasons, like the fact they don’t really lend themselves to skipping from track to track, which means you are more inclined to listen to the whole album. There’s just something magical about the simple act of a needle scraping it’s way across a piece of plastic to create music. And what music it is. You can’t leave it in its sleeve. And let it take you back. And the music that they play. Put the needle on the black. I sit and watch that vinyl spinning and it stirs my soul. Are you old enough to remember records? Do you still have an emotional attachment to them? This was my 22nd post for the A-Z Blog Challenge. Follow the blog during April for more writing tips, inspirational life posts, short fiction, film-inspired articles and more songs with audio recordings. Next post – W is for WIP – My work in progress. Hi Rinelle. I have nothing against MP3’s – I do know many purists who feel physically sick at their mention, though – I just love the tactile nature of records and associate them with lots of happy memories when growing up. MP3’s are more versatile and have allowed another revolution in music recording that I have benefited from enormously. Oh, that album brings back many memories…funny how a song (or even a photo of an album cover) can take you right back to where you used to listen to it! Yes Beth – its a great album actually. 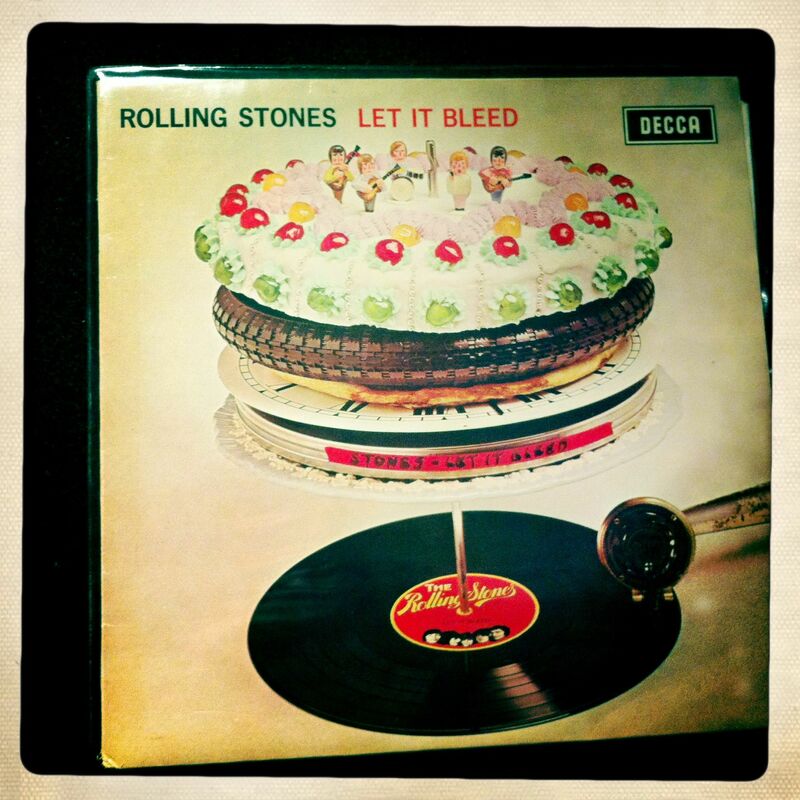 And, as a bonus little fact – celebrity chef, Delia Smith, created the cake for the album. It was one of her first cooking jobs! Thanks Maria – yes, pure nostalgia. 78’s? Wow, I don’t even have a turntable capable of playing those! I read somewhere that some of the best classical recordings were made on 78’s. It’s been years since I heard a vinyl I still have some in a cupboard but you brought back memoreies of playing the one line in a song I loved over and over again by lifting the needle up and down.Great song. Thanks Anne. Yes, I remember playing one of my dad’s 45’s of a brilliant song called ‘The Sweetest Feeling’ by Jackie Wilson over and over and over and over again. When we got our old vinyls out when the kids were young they were so used to CDs that it didn’t occur to them that you had to turn them over. Happy days. Yes – I can remember showing an album to my daughter when she was little only for her to say ‘wow, what is it?’! She was fascinated by it, though and was amazed when it produced music. Joking at the size and strangeness of 78’s.. little did I know there would come a time when people wouldn’t put the needle on the record! Unfortunately a painful split left my records somewhere else and they’ve never been returned. I’ll never forget them. Sorry to hear about the loss of your record collection, Lynne – but, as you say, at least you have the memories and music is like a time machine for transporting us back to another time and place.